← Should You Buy the Insurance for Your Rental Car? As we in the Midwest have learned over the past few days, is that winter weather can create some inconvenient, unexpected issues. But by taking a few precautions you can prepare yourself to get through with these winter road hacks. This post is sponsored by Rochester Hills Chrysler Jeep Dodge Ram. If you don’t have a garage and you park on the street (like me) it can get really icy – especially your locks! 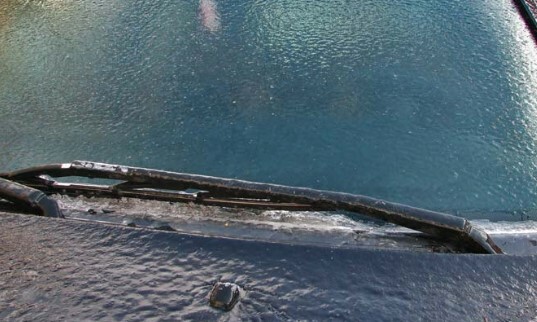 If you don’t have a commercial lock de-icer, hand sanitizer can do the trick! Since it contains alcohol – an ingredient that helps melt ice – it makes it the perfect de-icer! To help melt the ice, cover the end of your key with hand sanitizer and insert into the key hole, aiming to get as much product in the lock as possible. This should help melt the ice and help you get your car on the road. A good idea to make sure that you always have some with you, is to purchase a key ring that holds the sanitizer, so its hooked to your keys. Sometimes there is a lot of snow and sleet and it’s hard to get traction with your car – so use kitty litter! If you spread litter directly in front of the tires that are stuck, it can help your tires grip. Kitty litter is super cheap, so its a good idea to keep a bag in your trunk throughout the winter months. Before I go to bed at night, and I know its going to snow or ice, I put socks over my windshield wiper blades. It helps keep them from freezing and sticking to the windshield. You can also lift the blades completely off the windshield as an extra precaution. If you are like me, you keep all your plastic grocery bags you know just in case (they are handy for several reasons). You should keep a few of those in your glove compartment to help your side mirrors from freezing. If you have freezing temps (especially if it comes with rain or snow) cover each mirror with a bag to help keep the elements from icing over your mirrors. This can help you save TONS of time when it comes to getting ready to leave!